Mango Design's are the one's that i look for when i select Silk Sarees. Mango Design in the body of the saree attracts me a lot. 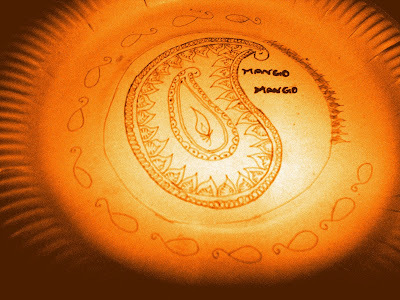 same as the mango design in mehendhi. I just wanted to sketch my favourite mango design for Mango Manthram by Adorable Indira, a new event to pull out the creativity among our bloggers. 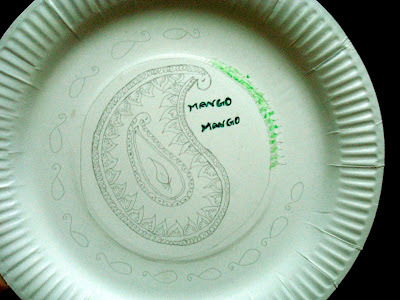 Here is my piece of sketch for mango manthram on a paper plate. So somehow i made this on the deadline..but i posted it on the scheduled date. Now Iam hapilly signing off..but i got to send my Fortune entry by tomorrow organised by my dear friend Shirya. Black-Eyed Beans Curry is my favourite one. 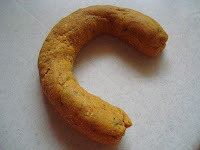 it taste's well with chapathi's and excellent with Rice. Only when you follow this particular order..it will taste Good. when you change the order of adding these powder's you can feel the taste difference. If you wish You can add two garlic pieces. 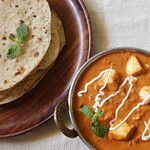 You can also add Tamarind water to enhance the taste of curry. In a Kadai, Heat the oil, add mustard seeds, when it pops up, add asafoetida powder, add fenugreek and red chilli's. when it is fried add the curry leaves and add finely chopped tomatoes. saute it well. when thel all come around togeather, add salt and keep adding the powder's one by one. also keep mixing before adding the sequel powder. now add the pressure cooked(3 whistle's) black-eyed beans to the kadai and mix well. add tamarind water/water(2 cups). close the lid and let the kadai sit in slow flame for about 5-7 minutes. add chopped corriander leaves before serving. 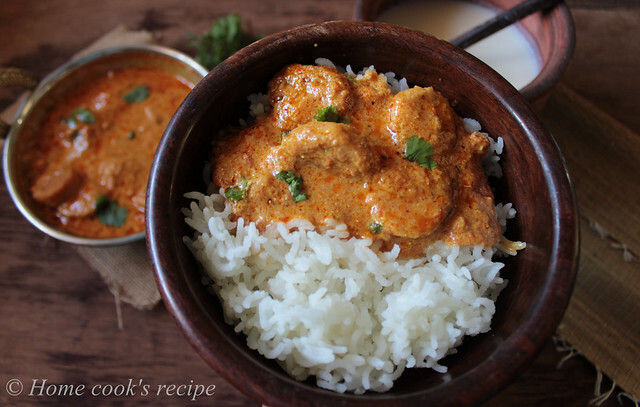 It Tastes so good with Curd Rice..
Iam Sending this Curry for Click-Event. 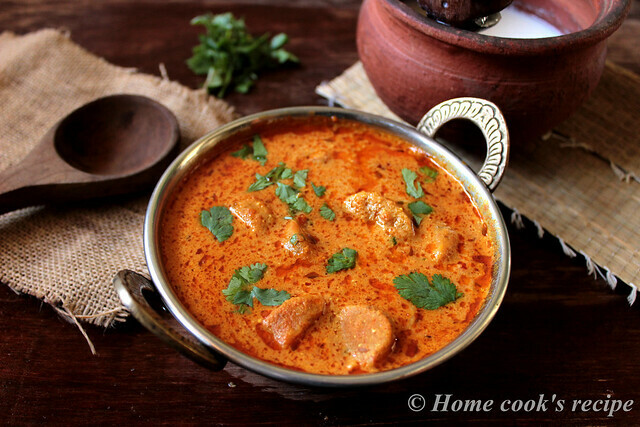 Gatte ki sabzi is a dish, that you can never miss out when you have Rajasthani meal. Gatte's are made with besan flour, and this sabzi is just made with gatte and with no other vegetables. any way you can add tomatoes as i did, but its optional. When i first made this sabzi at home, i did not have any idea about it. even i had never tasted it before. now(its been 4 years since i have tried it). i make this sabzi quite often when i run out of vegetables. also i have tasted this sabzi in a rajasthani restaurant. so now i can prepare this quite good with the experiences learned. I kept googling on what to try for RCI-Rajasthan hosted by padma. finally i landed on Vee's Gatte ki sabzi. I have tried quite few dishes from her blog...where she explains so neatly, that we cannot get confused with the order of what to do. she is really the best one to narrate the method of cooking. I can't narrate things like her..but just tell you what i did..well about this sabzi..it was so different in taste. me & hubby loved it a lot. and he asked me to prepare this for lunch regularly in this summer. It pairs well with chapathi as well as with rice. 1. 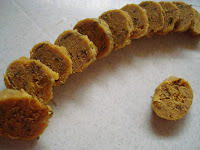 First, to prepare gatte, in a large bowl, mix besan flour, salt to taste, ajwain seeds, kasuri methi, turmeric powder, red chilli powder and mix well. 2. Now keep sprinkling water and knead to form into a firm and smooth dough. add 2 tsp of oil to the dough and knead again. 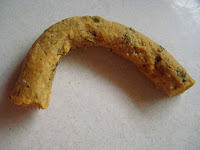 shape the dough into a 1/2 inch diameter roll. 3. In a wide large bowl / wide pressure cooker pan, add 3 cup's of water and let it boil, once the water starts to boil, put the roll into the water and let the roll cook for about 15 minutes at high flame. 4. Once the gatte roll is cooked, remove the gatte seperately from the water and let it cool down. once cooled, slice the gatte into 1/2 inch pieces. 5.Once you have sliced the gatte's, it is optional to fry the gatte's in oil. if you are frying the gatte's they may break up in the oil a little. after frying, they become little crisper, this way you can ensure that the gatte's are fully cooked. 6. Heat a cup of water, put the 2 tomatoes in it and let it boil for 5 mins, so that the tomato skin peel's a little. drain the tomatoes, cool them, peel it's skin, grind them into a smooth tomato puree and set aside. 7. Now to prepare the gravy, heat a pan, add 2 tsp's of ghee, add cumin seeds, hing, garlic paste and roaast well. then add the tomato puree and let it boil well and gets thickened for about 1 or 2 mins. Then add the sliced gatte's and mix well. reduce the flame before adding the curd. 8. Take a cup of curd and using your whisker or fork, beat the curd well. now add this beaten curd to the gravy in low flame and mix well. then add turmeric powder, red chilli powder, corriander powder, cumin powder, garam masala(optional) to the gravy and mix well. let the mix keep bubbling in low flame for about 5-10 minutes, till you see the oil on the sides of the gravy. 9. Remove the gravy from slow flame and garnish with corriander leaves. It is optional to add tomatoes, it just makes the gravy little sour and gives a good red colour to the gravy. Never add curd in high flame, it may curdle and the sabzi may get bad. Believe me or not, this sambhar is made at my mom's place every day for dinner. 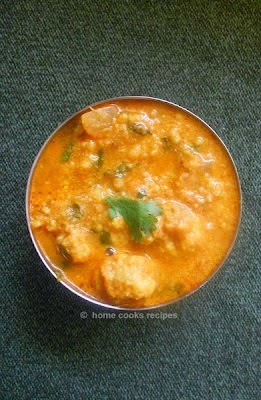 my father likes this sambhar very much. though i like this sambhar, having it on daily basis is not my take. 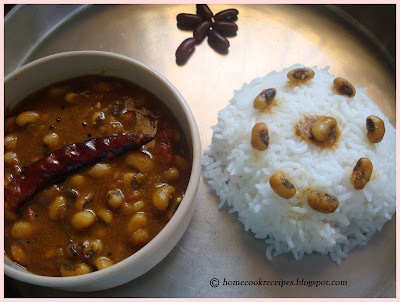 i prepare this sambhar whenever i feel homesick. This is a very subtle sambhar and pleases you in its humble way. 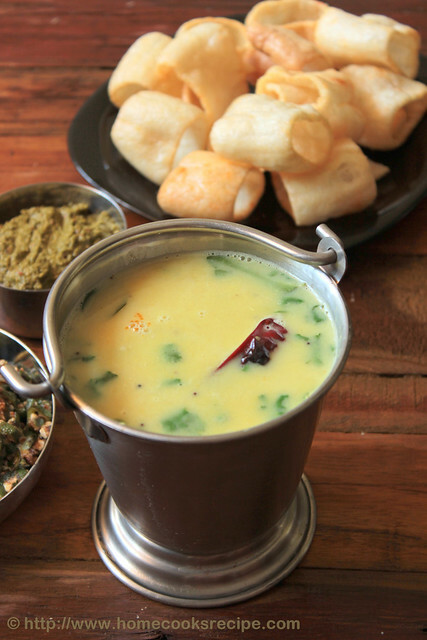 To go with this sambhar, you should either prepare potato fry or some pappad. 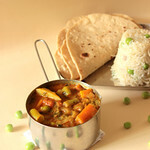 Eat this coconut milk sambhar with hot steamed rice, served in a banana leaf along with some vegetable fry and pappad. it is one of blissful south indian meal. 1. Pressure cook the tuvar dal with some water, a drop of oil, a slight pinch of turmeric and asafoetida powder for about 4 to 5 whistle count. Then mash the dal and set aside. 2. Grate half of a coconut and extract thick coconut milk from it. then dilute it with 1/4 cup of water. else if you are using packed coconut milk, take 1/4 cup and dilute with 1/4 cup of water. 3. In a pan, add 1 tsp of oil or ghee. when ghee turns hot, add mustard and let it pop. then add asafoetida powder, dry red chilly and crushed garlic. 4. Once the garlic gets half way cooked, add the mashed tuvar dal and stir well. you may add 1/4 cup of water and salt to taste and turmeric powder. let it boil. 5. 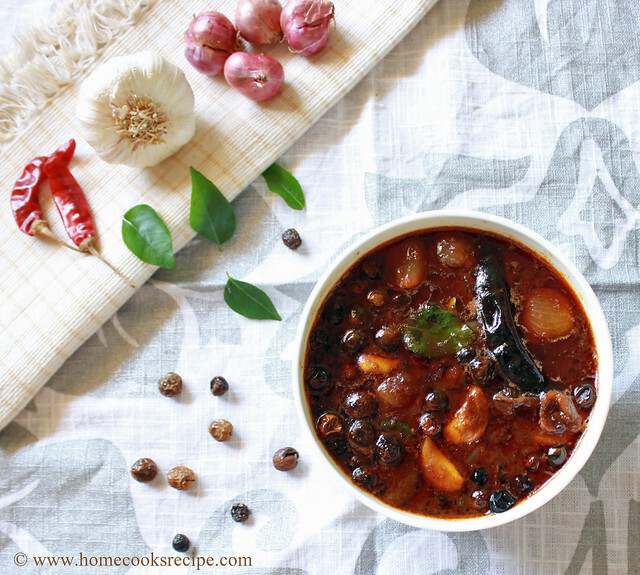 Once the sambhar starts to boil, reduce the flame to low and add in the coconut milk. check for the consistency of sambhar and add required water. this coconut milk sambhar should be little thicker than rasam. 6. On slow flame let the sambhar simmer for a minute. then add curry leaves and chopped corriander leaves. remove the sambhar from flame. 7. Transfer the sambhar to a serving bowl. 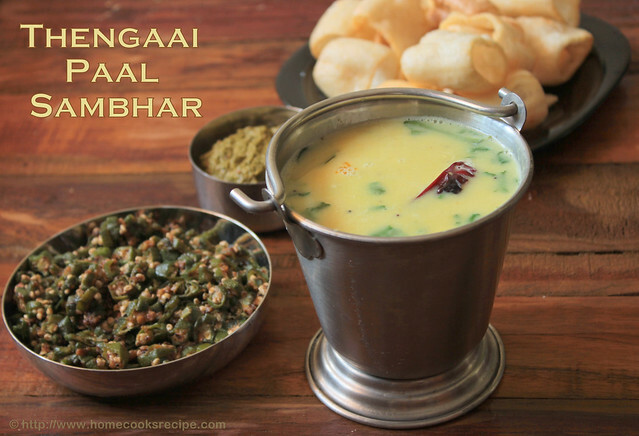 make appalam/pappad or some potato fry to go along with this sambhar. serve hot with rice. * Coconut milk sambhar should not be very thick. it should be in a consistency little thicker than rasam. 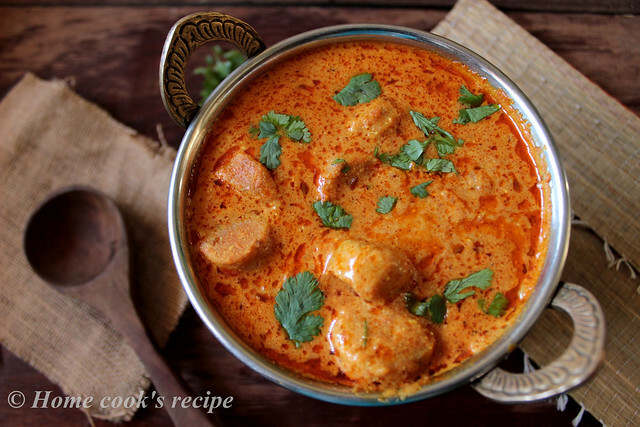 * Never boil the sambhar after adding coconut milk, as it may get curdle. Mexican Tomato Salsa and Mexican Pizza are my stepping stone's on to Mexican Cuisine. Mexican Omlette was the only thing i used to do previously. even i could say it made me to put up more weight. Mix all the above Ingredients along with a spoon of olive oil. 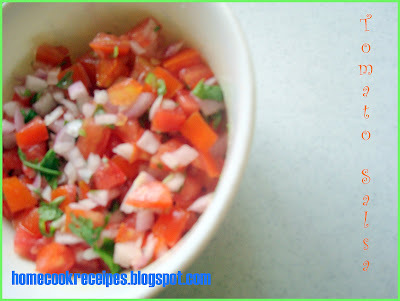 So Simple Mexican Tomato Salsa is Ready. I just applied olive oil on the ready-made pizza base, I applied a coating of cheese and spreaded the Simple Mexican Tomato Salsa and i grated the Mozarella cheese over it. 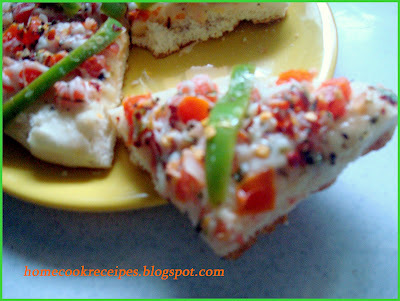 I added a little red chilli flakes over the pizza and sprinkled some oregano over it. also little salt. Just made this pizza on Dosa Tava within 5 minutes. It was so tasty. 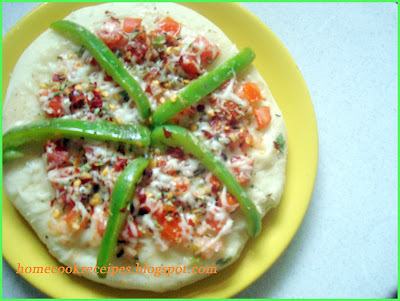 this is the first time i added the raw tomatoes and onions as the topping to pizza.. usually i fry onions and tomatoes along with panneer as topping's. or i just fry all the available veggie's with me as topping. it was so tasty to have it raw along with cheese. A piece of Mexican Pizza with Tomato Salsa as a Topping... I just Fried the sliced Capsicum's in a spoon of olive oil before placing on top. Waiting for a Big Byte?? Thank You Dhivi for This Mexican Idea..i really enjoyed surfing mexican recipe's and trying the above. In Between Happy Mother's Day To You All..
Iam Going To post My Mom's Signature Dish Tomorrow..So who are all joining me in posting your mom's Signature Dish ?? Iam Very Happy on my Second Award, "Yummy Blog Award". Thank You Miss Bellevue. Her Blog is so Nice, do Give a Visit Over there. As per the rules I am writing my favorite Sweets which I tried and Tasted. 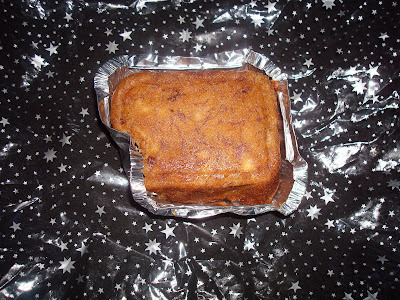 · The person who receives the award should display the "Yummy Blog !" logo on their blog and also the meaning of the award which is "Yummy blog award is the award given to the blog with most yummy recipes/photos". · The receiver should also quote their favorite yummy-licious :) dessert(s) that they have ever prepared/eaten. Don’t restrict yourself to any dessert, chocolate bars also welcome. · Also the receiver should pass on the award to four other bloggers whose blog they find "yummy" and let them know about the rules. It's been a few months since Kalai tagged me for a meme. I'd been postponing it, Today I'm finally forcing myself to do it. else i will get an array of meme's on my stack. Between I tried Kalai's Bell Pepper Chutney. It was so soo Good. Thank You Kalai For Sharing the Recipe and Passing this lovable Meme to me. Link to your tagger and post these rules.Share 5 facts about yourself.Tag 5 people at the end of your post and list their names (linking to them)Let them know they've been tagged by leaving a comment at their blogs. 1. I hate eating fruits. I have fought with my dad for not eating an apple that he forced me to eat. till now..it was a big fight according to me. 2. I do things in the last minute's. i even enjoy the thrill's of getting into running bus, last minute exam revision..etc. 3. I get tense for useless things and iam good in handling stressfull situation very easily. 4. I advise a lot to other people. i have even sufferd a lot because of advising to useless. 5. I wont be myself when anyone wake me up from my deep sleep. You can see the devil in me. Now I wish to tag Arundhathi, Nirmala, Jayashree, Kamalika, and Vaishali with Love. I’ve also been tagged by Namratha of finger licking food do the below MeMe. Thank You Namratha for Tagging me.. i enjoyed filling it up..
Guru..with my baby in me. Carrom..but i have never won the game. Cooking smell of my mom's which wake's me up from the bed. Not yet decided..but the name should end with "ya" as mine. go to Ice cream Parlour to buy it..
iam happy with my black hair colour. She is a amazing baker. I just visit her blog to drool. she is also responsible for my recent Cake Craze. Toys of my Son's..which he pushed under the bed, where i could not go. Yes..if it is with same parents. 30) OF ALL THE PEOPLE U HAVE TAGGED, WHO IS THE MOST LIKELY TO RESPOND FIRST?mmmm...SriValli..
Now I tag the following people to do this MeMe: Sra, Srivalli, Rajitha and Rachel. The Above Banana Cake was from Anu as a token of love, which was so delicious. It was so beautifully packed and tied around with a ribbon. I Really enjoyed meeting Blogging Friends. 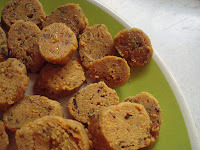 Do have a Check at Srivalli's blog to know what all we enjoyed sharing each other and exchanging comments the instant it was tasted. Like in TV Shows. 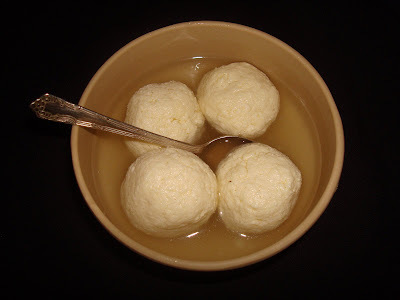 The above Rasagulla's were the one's that i took for the meet. Kamini's Aloo Tikki was so delicious..
Rachel's came out with a pizza like bread, which was very pacca in its taste. Sra's Paneer Gravy was so Rich and excellent. Jayashree's Jack Fruit payasam was so different and very tasty for me. iam sure it was a hit among us. Lakshmi's Curd Rice was so so soo Good..
Srivalli's Channa pulao and Coconut Burfi were very perfect and Tasty. 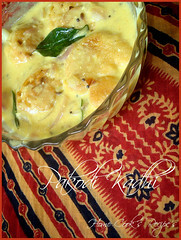 Kamalika's Chakara pongal was a Real Sweet Treat. Thank You Lakshmi for this Potluck Funda idea.